AKRON — On Thursday, July 20 I continued on in my adventures for my “Ballparks of Northern Ohio” series. This particular stop of my trek came in the form of Canal Park, home of the Akron RubberDucks. The RubberDucks are the Double A affiliate of the Cleveland Indians and on Thursday were hosting the Richmond Flying Squirrels, affiliate of the Toronto Blue Jays. Akron came away with the win on the evening, 4-3. With that victory, the three teams that I have watched are now 2-1. Visiting the city of Akron always brings back a sense of wonderful nostalgia for me. I attended the University of Akron for two years and for some reason, only attended one Minor League game while I was there. Back then, the ball club was the Akron Aeros. Fast forward what seems like a lifetime, I felt very welcomed by Media Director Adam Liberman and the entire RubberDucks’ staff. The entire atmosphere at Canal Park, located in the heart of downtown Akron at 300 South Main Street, was very laid back and friendly. The crowd was not overwhelming and the concourse very navigable which is always welcomed in an unfamiliar place or if a spectator is to find themselves traveling with small children. My long-time friend and instrumentalist extraordinare Tyler joined me for the game. While I was granted access to pretty much anywhere in the park, I decided to take in the game from a more spectator friendly manner. This also allowed me to not only catch up with Tyler but to also break down the game of baseball even more for a more novice fan. We enjoyed watching the ‘Ducks victory and afterwards continued to reap the benefits of Minor League ballparks’ promotions. After this particular match up, Canal Park had a fireworks tribute to the late George Michael. Say what you will about George but his music was undeniably catchy and was even more memorable with a fireworks display that was absolutely phenomenal. Although the regular season is coming close to a conclusion, there is still plenty of time to take in a game at Canal Park. To view their upcoming schedule of games, promotions and the like, visit the team’s official website at www.akronrubberducks.com. Similar to a visit to Huntington Park to see the Columbus Clippers, a trip to Canal Park is not going to break the bank. Here’s what to expect if one is planning a trip to the home of LeBron James to take in a game. Ticket price: The cost of catching a ‘Ducks game will run anywhere from $7 (suprisingly fantastic seats for general admission) to $25 for a seat in “Homerville”. What’s Homerville you may ask? For the cost of $25 a ticket, you will get access to the comfort of swivel-seats just above the right field wall. Your chances of snagging a home run ball is what gives this superb location its’ name. With that cost of the seat, you also get a voucher for 2-16 ounce beers or 4-24 ounce sodas at the Bud Light Lime Lime-A-Rita Tiki Terrace Bar. Parking: Free-$2; If available, one can park at a parking meter in Downtown Akron for free after 6 pm and all day on Saturdays and Sundays. Meters not available? Public parking, via a lot or a parking deck is available in multiple locations surrounding Canal Park for just $2! Hungry? Thirsty? : Hot dogs at a RubberDucks game are only $2, every game! In addition to the standard ballpark fare, Canal Park also offers a wide variety of eats from Godfather’s Kitchen, The Dog Pound, Tater’s and the Bier Garten. Are you like me and enjoy a cold, refreshing craft beer? Visit Jobu’s Craft Brews…yes, it’s named after Jobu from Major League. Ever wanted to eat 20 scoops of ice cream served on top of a brownie bottom out of a full sized replica baseball helmet? You can do that if you visit The Sock Hop Ice Cream and Candy Shoppe. No, I didn’t partake but the temptation was most certainly strong. If you happen to visit the park on a Thursday, the ‘Ducks have a Thirsty Thursday promotion. At selection stands on the first base and third base side of the stadium, you can get $1 10 ounce drafts of Yuengling or up it to 20 ounces for just $2. Make sure to get a free wristband or your beer consumption is not happening. Also, at stands equipped with fountain service, you can pick up $1 sodas! Last but not least, a big thank you to Adam and the entire RubberDucks staff for working with me and giving me the opportunity to take in a game for my segment! A shot from the third base side of the concourse at Canal Park in Akron, OH. The Akron RubberDucks defeated the Richmond Flying Squirrels by a final of 4-3 last Thursday evening. https://www.galioninquirer.com/wp-content/uploads/sites/38/2017/07/web1_Canal.jpgA shot from the third base side of the concourse at Canal Park in Akron, OH. 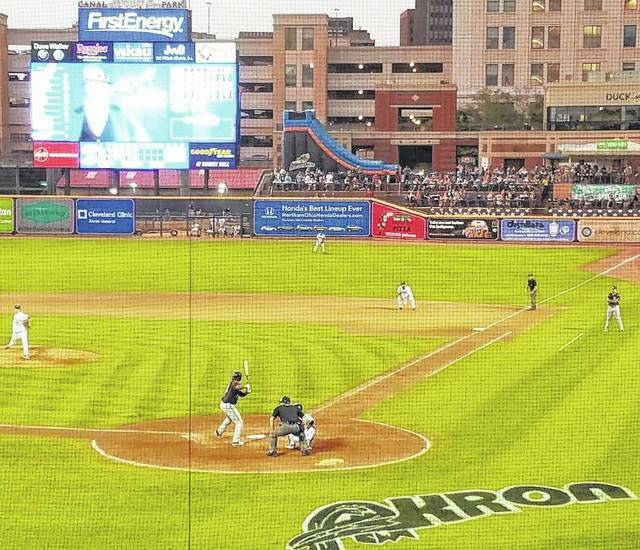 The Akron RubberDucks defeated the Richmond Flying Squirrels by a final of 4-3 last Thursday evening.